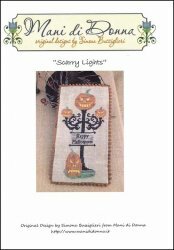 Scarry Lights [W5317] - $15.00 : Yarn Tree, Your wholesale source for cross stitch supplies. Cross Stitch pattern from Mani di Donna. Follow the "Scarry Lights," to the haunted house. This light pole isn't just any light pole, this light pole features scarry pumpkins. A "Happy Halloween," sign is hanging off the light pole as well. Stitch count is approximately 56w x 109h.